In honor of National Bike Month, the League has released its latest Bicycle Friendly States ranking. Washington state achieved the top ranking nationally for a sixth consecutive year (League Bike-Friendly-State 2013 Scorecard). The Bicycle Friendly States Ranking is now more comprehensive than ever, capturing more information than ever before and delving more deeply into the issues embedded in becoming a more bicycle-friendly state. The League of American Bicyclists partnered with Washington Bikes to review and provide recommendations for next steps to make Washington’s streets safer and to grow bicycling statewide. 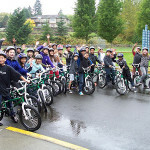 Washington’s top ranking was based on a number of key indicators, including infrastructure and funding that provide on-the-ground bicycle facilities; education and encouragement programs that promote cycling; and passage and enforcement of bicycle-friendly laws that make it safe and comfortable for people of all ages to ride. 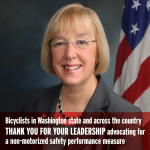 While the state still has much more to do in making Washington’s roads safer for bicycling, this ranking recognizes Washington’s progress relative to the rest of the nation. Washington state was recognized as a leader in using the previous federal Transportation Enhancement program and the new Transportation Alternatives federal program for bicycle and pedestrian projects; the League notes that other MAP-21 federal funding programs can be utilized to include biking and walking in all transportation projects. The Bicycle Friendly States program is more than an annual assessment. Throughout the year, League staff will work actively with state officials and advocacy leaders to help Washington state identify and implement the programs, policies and campaigns that will improve conditions for bicyclists. Our view at the Bicycle Alliance: We’re proud of Washington’s continued recognition as one of the best places to bicycle in the entire country. At the same time we will continue to work for improvement in how we identify and overcome barriers that keep people from riding, how we better collect and track data and then address issues around bicycle safety and collisions, and how we identify and prioritize opportunities for investment in non-motorized transportation. To see how Washington ranked in the five evaluation categories and to learn more about the Bicycle Friendly States program, see www.bikeleague.org/states. For a list of Washington businesses, communities, and universities that have earned recognition from the League, see our Bike-Friendly Washington page. The Bicycle Friendly Community, Bicycle Friendly State, Bicycle Friendly Business and Bicycle Friendly University programs are generously supported by program partner Trek Bicycle. 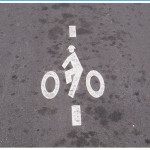 Learn more about the Bicycle Friendly America program at www.bikeleague.org/bfa. This article was posted in Funding/Policy, Infrastructure, Issues & Advocacy, News, Safety, Transportation, WSDOT. Bookmark the permalink. Follow comments with the RSS feed for this post. Both comments and trackbacks are closed. In 2010 4,250 pedestrians were killed by vehicles hitting them.Only 618 bicyclists were killed by vehicles hitting them. Yet bicyclists seem to think they should wear helmets when people on foot are killed way more often. Stop making a fool out of yourselves by wearing those queer hats when there are far more deaths from other things you are too stupid to react to. Total deaths are more important than deaths per mile traveled.